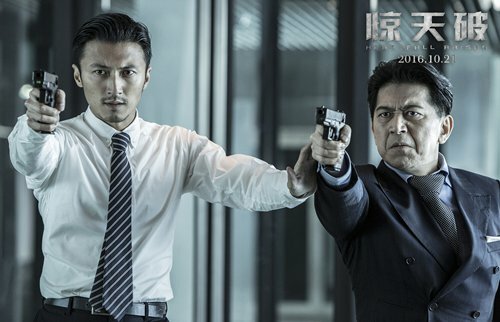 Hong Kong suspense/action film Heartfall Arises, directed by Wu Pinru and starring Nicholas Tse, Sean Lau,Tong Liya, Mavis Fan and Gao Weiguang, will hit big screens across the country on October 21, the film's producers announced at a press conference in Beijing on Sunday. Additionally, the producers announced that two versions of the film will be screened in theaters: the original Cantonese version and a dubbed Putonghua (Standard Chinese) version. This move is significant as Heartfall Arises will mark the largest screening of a film in the Cantonese dialect in China. The film follows detective Ma Jin and criminal psychologist Che Jiawei as they work together to solve a case involving a serial killer. As they put clues together, they soon find themselves involved in a larger conspiracy that endangers the lives of millions of people. The film also marks the second time Tse and Lau have worked on a film together. The duo previously appeared together in The Bullet Vanishes four years ago.